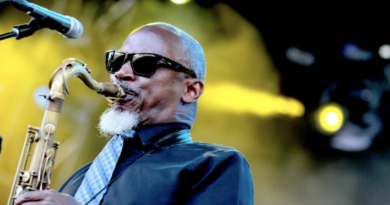 Karl Denson’s Tiny Universe barreled into New York City with a celebration of the unparalleled Beastie Boys canon, and a handful of the patented, sensual funk grooves that made them famous. 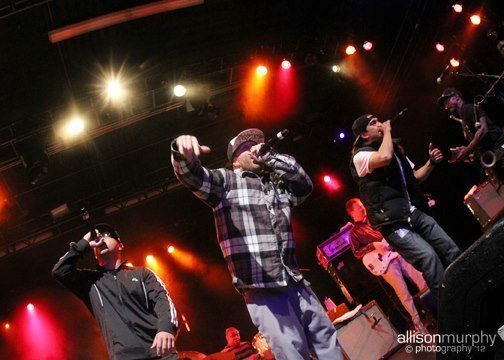 Enlisting members of Slightly Stoopid to execute this tribute, the crew started in Boston on Friday and arrived in Manhattan where the hometown hoe-down was to take place on Saturday night. The stage was set for a serious ‘root down’; Denson and company did not disappoint. Soulive drummer Alan Evans Trio started off the festivities with a feisty, enjoyable short routine. Building jams out of a handful of songs off of the recently released “Drop Hop”, AE3 impressed folks with a loose and fun vibe that set the table for the headlining show. The marquee read Karl Denson’s Tiny Universe featuring members of Slightly Stoopid: A Beastie Boys Tribute. Opening with the rotund rare groove stylings of “Apres Ski”, KDTUsettled into their expanded arrangement with Slightly Stoopid’s OGon percussion and De La sharing tenor sax duties with the bandleader. Immediately they charged into an updated and uptempo’d take on their longtime seductress, “Chance With You.” The now-swollen audience began to groove harder, calling to mind Tiny Universe shows past in a city they once owned. The crew dropped into a driving blaxploitation-themed groove that harkened back to the sensual energy that drenches the band’s sonic trademarks. And they were off and running hard, drummer John Staten and bassist Chris Stillwell locked and loaded, emptying clips at a frenzied pace. Denson and Trumpet/flugelhorn player extraordinaire Chris Littlefield laced the driving groove with sultry heads that morphed into the bright and easily recognized lead from “Hey Jude”. Likely sensing the New York bar he’d set so high nearly a decade ago, Karl and the boys did the unthinkable and dusted off an epic, five-movement song they hadn’t touched since August 2002. Debuting at the very first-annual Bonnaroo, during KDTU’s mammoth three-set late-night rage; “Odessus” had not even a name that monumental summer, but left an indelible imprint on any person privileged to hear any of its three performances (this writer was lucky enough to catch two of them). The song has lived on in infamy deep within the hearts and minds (and butts, feet, et. al) of KDTU-freaks for ten long years. Until this December Shabbat eve in Times Square, where what constitutes the biggest bust-out of this longtime Denson denizen’s fifteen years as a fan was ferociously detonated on the domes of a mesmerized massive. Groove-merchant jazzy vibes give way to brutal breaks and sinister stutter-steppin’; each band member got his chance to work it out with authority atop the various terrains of terror this tune travels. Totally faithful to its bombastic Bonnaroo beginnings, Denson lead his troupe into a triumphant trek homeward bound, bringing together ten minutes of pure, unadulterated, crunkalogic science. “Odessus” was well worth its decade-long wait; deliverance of a different kind. After a much needed deep breath, Denson paid respect to the dearly departed Adam Yauch- also known as MCA from the Beastie Boys. The crowd sensed that it was time to get ill; and OG, Kyle and De La from Slightly Stoopid joined the Tiny Universe on the large stage for the evening’s feature presentation. 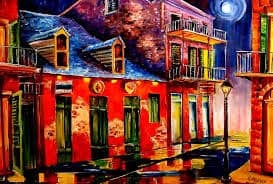 For it was at Jazzfest in New Orleans, on that fateful Friday morning, when we were delivered the crushing blow that was the loss of Yauch; and it would be the Tiny Universe who would serenade his soul later that evening. Six months on, Denson came to the city where the Beasties made their bones, and brought with him the ultimate homage and celebration of his life, and the songs, styles, and cultures of which the B-Boys gave birth. This would be no easy task in New York City; one to be handled with respect and admiration to the generations of fans that Yauch and his ‘bad brothers’ left in their tidal wake. Beginning with a dead on take of the devilish-nursery rhyme “Paul Revere”, the swollen band took on a handful of classics from 1986’s titanic debut Licensed to Ill. The fantastic recreation of the seminal Roland 808 drum machine was a sound to behold, Staten’s kick/snare/hat augmented by synth boom from Littlefield and keyboardist David Veith. When the crew broke into the undeniable guitar break on “No Sleep til Brooklyn”, the place about exploded; the trio of Stoopid emcees passed the rhymes with atypical Beastie flair; they (somewhat cartoonishly -but props for authenticity) passed out cans of beer to the crowd like the King Ad-Rock once loved to do (though they refrained from shaking the beers and soaking us!). The band’s dynamics shone bright on the bulky “Brass Monkey”, as Denson’s sax served as the call to arms. The emcees were dressed in the best in Beastie fashion that covered their earliest eras. The teenager-rager anthem “Fight for Your Right (To Party) raised the energy level skyward; indeed this was a celebration! Unfortunately, they band skipped the seminal record Paul’s Boutique (much to the chagrin of this writer), and picked things up with the organ-grinding bounce of “So Whatcha Want” from 1992’s Check Your Head. Making the most of the sample employed from SouthSide Movement’s 1973 gangsta-lean “I’ve Been Watching You”, the Stoopid/Universe collaboration reached an apex that it maintained for the remainder of the evening. Looking around, it was hilarious to watch so many people lose themselves in their memories, wild gesturing and posturing ala the song’s once omnipresent video. Grown men spastically spitting the rhymes of their youth to one another with genuine elation, while playing ‘air-DJ’ along with guitarist DJ Williams, a double entendre as Williams employed a Tom Morello-esque technique that mimicked Ad-Rock’s undeniable record scratches. 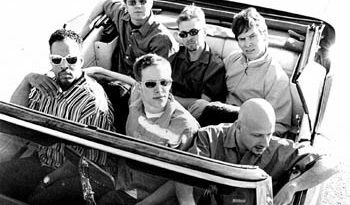 “Sabotage” was pure punk pomposity, as the band delivered a loose and energetic take on the distinctive song that introduced Yauch’s unique bass-playing style to the masses. Again, the audience belted every single word (with hand gestures and gratuitous spitting); just before the monstrous bass-led re-entry, the boys once again shouted out MCA as we screamed “Why!” in unison. While I didn’t notice Buddy Rich in the house, just about everybody flew off the handle. During “Root Down”, The Tiny Universe mined source material like Jimmy Smith’s classic “Root Down (And Get It!) and Doug E. Fresh’s “The Show”; a testament to the disparate influences and “roots” of the Beastie’s canon. On “Sure Shot”, Denson picked up the flute and delivered a beautiful take on original sample “Howlin’ for Judy” by Jeremy Steig; before the emcees stepped up and redirected the song to its hip-hop counterpart. Most poignant was Yauch’s final verse; a mea culpa of sorts, where he famously and bravely apologized and challenged the misogyny found in many rap records, including the group’s own early work. It is these four sentences that redirected the Beasties reputation from frat-rap rockers toward the conscience and awareness of a generation and genre; this rhyme is MCA’s legacy more than any other. The disrespect of women has got to be through!